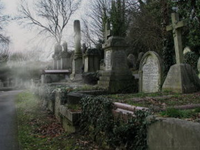 Most Londoners have, at some time, visited Highgate Cemetery, the world class high-Gothic nature reserve on our doorstep, and it is a popular tourist destination. Dating to 1839, it contains 170,000 corpses – that’s as many people as the “current living” population of Chattanooga, Tennessee. Most thrilling is the western side, only accessible by guided tour, such is the frailty and beauty of its steep hillside location. Those Egyptian Catacombs! The Cedar of Lebanon! And here you’ll find a roll call of “names” from George Eliot to Beryl Bainbridge and Alexander Litvinenko, who was killed with polonium in 2006 and is entombed in a lead coffin to prevent the leakage of radiation from his grave. Equally worth a few hours’ wander is the flatter eastern side, which anyone can visit for just £3. It is most famously home to NW5’s legendary former resident, Karl Marx, whose tomb was subject to attempted bombings in 1965 and again in 1970. But that’s another story. The outcome? Why, a media frenzy of course, focusing on an “official” vampire hunt Friday, March 13, 1970. By this time, arbiters of popular culture ITV had lined up interviews with both Manchester and Farrant, broadcast early on the evening of the 13th – and within two hours, a sizable crowd armed with garlic, crosses, holy water, and stakes pushed through a line of policemen to become part of the hunt. It’s not clear exactly what Farrant and Manchester did that night, but there were rumors of attempts to open tombs and garlic being chucked around a bit. But thankfully, no stakes through the hearts of the undead. Farrant and Manchester persisted in their hunt for otherworldly presences, with the former being found by police soon after carrying a crucifix and wooden stake, and the latter claiming (in his own book) that he forced open a family vault and was about to drive a stake through a body – but was deterred, at the last minute, by a companion. The cemetery is certainly spooky enough to be the home of a vampire. New tombstones alongside ancient ones crowd the paved and dirt paths that weave through Highgate. Thick vines obscure the oldest markers that jut at angles from the ground deeper into the trees. Many of the stone vaults are broken, or twisted open by encroaching tree roots, giving the impression something has crawled from the grave. However, there is no evidence of Manchester’s Romanian nobleman. Nevertheless, in his book The Highgate Vampire, Manchester, who claims to be a bishop in the Old Catholic Church, said he tracked down the vampire years later and killed it. David Farrant, who started the reports, has written many books on the paranormal, including one called Beyond the Highgate Vampire. In an addendum, Farrant is now president of the rather genteel-sounding Highgate Vampire Society. The people who run Highgate these days call themselves Friends of Highgate Cemetery and are a bit squeamish about vampires and the horror movies filmed there. But visitors still ask about ghosts and the reports of phantom encounters are as prolific as ever. Sources: Stephen Emms, Kentish Town Studio; QuirkyTravel; and MysteriousUniverse. We went to Highgate when we were in England in 2009 and we went to both the east and west sides. The east side is closed except to organized tours and we had made arrangements for a tour guide to take our group on a private tour, but you can wander around on your own on the west side. That man in the photo looks like Barnabas Collins! Who is he? Like everyone, I've heard of the Highgate Vampire, but didn't know the backstory. Great article. I haven't read or seen anything about Highgate Cemetery in ages. If anyone finds any articles about recent sightings of ghosts or anything else strange in Highgate, please share. No one ever answered Madeline's question. Does anyone know who the man is? It's supposed to be from the 1970 film Taste the Blood of Dracula, starring Christopher Lee, but I don't know the identity of the man in the photo.